Fantasy sports operators have existed in the Australian market for some years. Initially, they were regulated as a form of trade promotion, whereas now they are treated by regulators as a form of bookmaking. This regulatory treatment may be subject to change as more fantasy sports operators enter the Australian market. No specific regulation of ‘pool betting’ exists in Australia. Traditionally, newspapers offered ‘soccer pools’; however, these are regulated as a form of lottery and have since been superseded in popularity by various forms of betting products. In respect of the conduct of a totalisator, exclusive licences are granted to totalisator operators in all Australian jurisdictions. These operators are licensed to accept bets relating to a contingency (generally, the outcome of a racing or sporting event), which are then contributed to a pool that is paid out by reference to successful bets (after the operator deducts a percentage of the pool as commission, as well as various fees and taxes). However, gambling has long been a part of Australia’s culture and identity and, together with racing and sport, is well established in the national consciousness. State and territory-based regulation of gambling in the early 20th century marked the beginning of the legislative regime in place today. With the introduction of online wagering in the late 20th century, the industry continues to flourish, despite the continuing conflict between the economic returns provided by the gambling sector to the state and territory governments, and the pressure for governments to take action to minimise problem-gambling behaviour. Historically, all the lottery and totalisator operators were government-owned entities. Almost all states and territories (Western Australia being the exception in respect of its totalisator and lottery) have corporatised and privatised their gambling operators. Almost all leading gambling businesses in Australia (most of whom are listed) conduct business under a licence granted by a state or territory government (or regulator). e Crown Resorts Limited, which operates casinos in Melbourne and Perth (and Sydney from 2021). In Western Australia, the totalisator and lottery is conducted through state-owned corporations, respectively operated by Racing and Wagering Western Australia and LotteryWest. However, the Western Australian government is expected to follow the lead of the other states and territories and to conduct a tendering process in the near future in respect of the exclusive licence to operate the state’s totalisator. Save for Queensland, the right to operate a casino has been the subject of an exclusive licence in the relevant jurisdiction. The recent issue of new casino licences in New South Wales and Queensland is discussed further in Section II.iv, infra. As mentioned in subsection iii, supra, licences to conduct gambling are issued by the relevant state or territory government (or regulator), including those listed in Section II, infra. Traditionally, gambling was conducted solely in venues. However, as a result of new technologies and the challenges posed by gambling monopolies in most Australian states and territories, a number of gambling businesses (particularly in the wagering sector) are licensed to conduct gambling remotely. This includes corporate bookmakers, most of whom are subsidiaries of the leading European online betting companies. Each licensing jurisdiction imposes different licence conditions on its licensed operators, by reference to the relevant legislation. Most online corporate bookmakers, for example, are licensed in the Northern Territory, by the Northern Territory Racing Commission. In 2001, the federal government enacted the Interactive Gambling Act 2001 (Cth) (IGA), which prohibits the provision of ‘interactive’ (or online) gambling services with an ‘Australian customer link’. Broadly speaking, the IGA prohibits the provision of ‘interactive gambling services’ to persons present in Australia (the Operational Prohibition). Specific exemptions exist in respect of wagering services (with the exception of in-play sports betting services provided online) and lottery services (with the exception of instant or scratch lotteries). In addition, the IGA prohibits the advertising of ‘interactive gambling services’ in Australia (the Advertising Prohibition). A defence to the Operational Prohibition is available where the operator did not know, or could not reasonably have known, that their service had an ‘Australian customer link,’ that is, that any or all of the customers of the service were physically present in Australia. The IGA is enforced by the Australian Communications and Media Authority (ACMA) and the Australian Federal Police. However, since its introduction, the IGA has been criticised as an ineffective means of preventing unlicensed offshore gambling services from being offered online to Australian residents. In response to these criticisms, late last year the federal government introduced the Interactive Gambling Amendment Bill 2016 (IGA Amendment Bill). Broadly, the aim of the IGA Amendment Bill is to clarify the existing law, increase penalties for infringement and give greater enforcement powers to the ACMA. The IGA Amendment Bill has been debated by both Houses of Parliament and is likely to be passed later in 2017. Australia is a federation. In practice, this means that legislative power is divided between the federal government and the eight constituent states and territories. This is no different for gambling. Traditionally, the power to regulate gambling activities in Australia was reserved to the states and territories. This changed in 2001 with the enactment of the IGA. Save for legislative reform proposed by the federal government in 2012 to regulate the sale and use of poker machines (which is no longer in effect, save to a limited extent), and the IGA, the government has recognised that the regulation of gambling is a matter within the jurisdiction of the states and territories. Whereas the IGA regulates interactive (or online) gambling services, state and territory legislation continues to regulate land-based gambling activities4 and sets out different regulatory frameworks for different types of gambling, including casinos, sports betting, gaming machines and lotteries. Even though the federal government’s proposal of poker machine regulation in November 2012 was unsuccessful, there remains the possibility that the government may intervene in the future to regulate further land-based gambling, particularly gaming machines. In certain states and territories, a different regulator is responsible for the regulation of the casino. For example, the Independent Liquor and Gaming Authority is responsible for determining the regulatory arrangements that apply to the operation of casinos in New South Wales. As indicated in subsection i, supra, interactive (or online) gambling services are regulated at the federal, and state and territory levels, while land-based gambling is regulated mostly at the state and territory level. Land-based gaming is regulated largely by state and territory legislation, which is principally directed at gambling products or services that are venue-based. These include operators of wagering and lottery terminals, and gaming machines. However, certain federal laws apply to land-based gambling, such as the laws relating to anti-money laundering and counter-terrorism financing (see Section IV, infra). Generally, an exclusive licence has to be granted in each state or territory to conduct off-course betting in retail venues. Similarly, an exclusive licence has to be granted to provide lottery products (which are available for sale by retailers, principally in newsagents). Further, licensed venue operators are permitted to conduct land-based machine gaming (such as slot machines, known in Australia as poker machines). These venues include casinos, pubs and clubs. The sole exception to this principle is in Western Australia, where gaming machines are only permitted in casinos. Certain restrictions are imposed on the operation of gaming machines by licensed venue operators, such as caps on the total number of machines in any particular venue, locality or in the jurisdiction as a whole. The regulatory regime in respect of gaming machines differs substantially from jurisdiction to jurisdiction with Victoria, for example, having a mandatory pre-commitment system in place (which players can opt out of). Until recently, there was a limited number of casino licences granted in each state and territory. However, in recent years, this exclusivity has been relaxed. Previously, in New South Wales, the exclusive casino licence was held by Echo Entertainment Group Ltd (now The Star Entertainment Group Ltd). In 2015, the New South Wales state government granted a licence to Crown Resorts Limited for the construction and operation of Crown Casino at its new Barangaroo development in Sydney (which is due to open in 2021). Similarly in Queensland, the government has granted additional casino licences to various private entities. The IGA prohibits the supply of online gambling services to persons resident in Australia. However, this prohibition does not apply to other types of gambling services provided online. The exception that exists under Section 8A(1) of the IGA in respect of online wagering does not extend to online in-play sports betting. That is, the ability of wagering operators to provide in-play sports betting is restricted to bets placed over the telephone via a voice call or in licensed venues only. However, in 2015, the concept of ‘click-to-call’ services was introduced by various corporate bookmakers to facilitate in-play betting on sports through the use of synthetic voice technology. This technology allowed customers to place in-play bets from their smart phone and other devices via a telecommunication connection. The IGA Amendment Bill proposes to prohibit these services by clarifying that the use of a recorded or synthetic voice in a communication means that communication will not amount to a ‘voice call’ and therefore that bets made in this manner will not considered to be a bet placed over the telephone. The IGA Amendment Bill also introduces the concept of a ‘place-based betting service’, which will allow online in-play betting on sporting events when placed using ‘electronic equipment’ at the venue of a licensed operator. Licences granted to Australian operators to provide gambling services online often impose restrictions on the location and manner in which the licensed operator may conduct its gambling business. For example, gambling operators licensed by the NTRC are required to locate various aspects of their gaming operations in the Northern Territory. In addition, the conditions of the licence has the effect that bets are deemed to be placed, received and accepted in the Northern Territory for the purposes of the licence, irrespective of where the customer placing the bet is located. The process involved in applying for a licence to conduct a gambling business in Australia depends on the type of licence and the jurisdiction in which it is sought. For example, in respect of remote wagering, the Northern Territory is the leading licensing jurisdiction in Australia and licences are granted by the NTRC. Until recently, the Norfolk Island Gaming Authority (NIGA) was a popular licensing jurisdiction for online gambling operators wishing to operate in the Australian market. However, because of the events discussed in Section VII, infra, the NIGA was dissolved and all licences issued by the NIGA expired on 31 March 2017. While other states and territories have their own licensing regimes, these regimes have not been ‘tried and tested’ in the same way as the Northern Territory regime. The licensing process will typically last for up to six months. The probity process involving land-based casino licences may involve a period of over a year. Restrictions on the type of activity that can be conducted or the manner in which a gambling business may be conducted are usually contained in the terms and conditions of a licence and the underlying legislation. Failure to comply may lead to sanctions for breach of the licence, contravention of prohibitions set out in the relevant legislation, or both. At the federal level, the Operational Prohibition under the IGA carries a penalty of 2,000 penalty units, which is the equivalent to A$1.8 million for a corporation. The penalties proposed by the IGA Amendment Bill for the breach of the Operational Prohibition will be 5,000 penalty units for a criminal offence (equivalent to A$4.5 million for a corporation) and 7,500 penalty units under the new civil penalty provision (equivalent to A$6.75 million for a corporation). Generally, liability is placed on the operator of a prohibited gambling service rather than the customer for the participation in such services. However, liability may be placed on individual users of gambling services in limited circumstances. For example, the gambling legislation in New South Wales and Western Australia prohibits the placement of a bet on an Australian race with an unlicensed wagering operator. Notwithstanding these prohibitions, we consider it unlikely from a policy perspective that authorities will prosecute individuals under these provisions. An overseas operator may be found liable where an offence provision is expressly stated to have extraterritorial effect. The offence provisions in the IGA are expressed to apply extraterritorially. However, the practical difficulties that exist in enforcing Australian legislation against overseas operators has previously inhibited enforcement activity under the IGA. This problem is addressed in the IGA Amendment Bill by extending liability for the provision of unlawful gambling services to an operator’s directors and officers, as well as to persons involved in aiding or abetting the commission of the offence. There is no general principle extending liability to directors or officers of a gambling operator for the acts of a company. However, in cases where there is a prohibition on certain activities, certain state and territory legislation extends these prohibitions to the directors and officers of the company in line with the aiding and abetting provisions of Australia’s criminal laws. For example, Section 53 of the NSW UGA stipulates that a director of a corporation that is in breach of the NSW UGA will commit an offence where the director ‘aids, abets, counsels or procures the commission of the corporate offence’. At the federal level, the IGA Amendment Bill will introduce civil aiding and abetting provisions for breaches of the IGA (in addition to the existing operation of criminal aiding and abetting provisions). The IGA Amendment Bill also proposes to confer notification powers on the ACMA that will allow it to provide information relating to illegal services to Australia’s border protection agency and place directors on the ‘Movement Alert List’ (MAL) maintained by the Department of Immigration and Border Protection. A person named on the MAL may be prevented from entering Australia. The IGA Amendment Bill proposes to increase the potential to prosecute for ‘aiding and abetting’ an offence under the IGA. Under the IGA Amendment Bill, parties such as a business-to-business (B2B) service provider, may be consider to have ‘aided and abetted’ the commission of either civil or criminal offences under the IGA. There is no legislative requirement placed on internet service providers (ISPs) to implement technical measures (such as geo-blocking) to prevent Australians from accessing a site permitting access to prohibited gambling content (including services provided by an illegal, unlicensed offshore operator). In 2015, the federal government ordered a review of the IGA (the O’Farrell Review). In its response to the recommendations of the O’Farrell Review, the government indicated that it would discuss with banks and ISPs options for the introduction of payment blocking and ISP blocking technologies as a means of restricting the access of persons located in Australia to illegal interactive gambling services. It is envisaged that these discussions will take place as part of the final stage of a three-stage plan proposed by the federal government in implementing the recommendations of the O’Farrell Review. Penalties for non-compliance with the AML/CTF Law are significant. In 2015, AUSTRAC filed an action in the Federal Court against three Tabcorp Group companies for ‘extensive, significant and systemic non-compliance’ with AML/CTF Law. In March 2017, the Federal Court approved a settlement agreement under which Tabcorp agreed to pay to AUSTRAC a A$45 million penalty (and costs) for contravention of AML/CTF Law. In Australia, match-fixing is dealt with under relevant criminal legislation in most jurisdictions, (e.g., in New South Wales, Part 4ACA of the Crimes Act 1900 (NSW)). Under legislation in most Australian jurisdictions, wagering operators are required to enter into integrity agreements with each relevant racing controlling body and the leading sporting bodies on which they offer betting products.5 These agreements allow the operator to use the statistical information relating to the sporting or racing events (and participants) in return for a fee and on the condition that they agree to cooperate with these bodies by providing information about their customers’ betting patterns and behaviour to assist in the investigation of match-fixing. All Australian companies, including gambling operators, are required to pay corporate income tax (currently 30 per cent6) and goods and services tax of 10 per cent on all sales. It is proposed that goods and services tax will apply after 1 July 2017 to overseas suppliers of goods and services to Australian customers. These proposals are likely to apply to offshore gambling services supplied to persons in Australia. c fees charged by sports or racing control bodies to wagering operators in consideration for the use of race field and sports fixture information. This fee is generally calculated by reference to a percentage of gross revenue or turnover of the wagering operator in connection with the relevant sport or racing event. The nature and extent of these taxes vary significantly depending on the type of gambling service provided and the relative market share of the operator. Recently, legislative changes on a state level have imposed further taxes on gambling operators. In July 2016, the Treasurer of South Australia announced the introduction of a ‘place of consumption’ tax (PoC Tax) of 15 per cent of net revenue derived from customers located in South Australia. This is due to come into effect on 1 July 2017. In early 2017, the federal government discussed the possibility of introducing a point of consumption tax for gambling operators that will apply federally. No legislative proposals introducing this tax have been released to date. There is a complex arrangement of rules that regulate the advertising of gambling, including in state and territory legislation, which varies from jurisdiction to jurisdiction. In addition, there are industry codes (such as the Australian Association of National Advertisers Wagering and Marketing Communication Code), as well as more broadly applicable laws, such as federal consumer laws (which prohibit misleading and deceptive conduct). Strict laws apply specifically to advertisements published in traditional media, such as on print, television and radio advertising. Recently, the federal government has proposed to undertake a reform of Australia’s media laws, which will include further restrictions relating to the advertising of sports betting in the course of live sports broadcasts. Land-based advertising in pubs, clubs and hotels where retail betting is offered is also subject to restrictions. Recently, regulators have shown an increasing willingness to enforce compliance with advertising prohibitions, particularly the Inducement Prohibitions. In the past 12 months, the New South Wales regulator, Liquor and Gaming NSW, has brought court actions against a number of Australian-licensed wagering operators for unlawful advertising. In February 2017, Tabcorp was convicted and fined A$16,500 and ordered to pay legal costs of A$100,000; while in April 2017, Ladbrokes was convicted and fined A$35,000 and ordered to pay legal costs of A$50,000. Both were found to have published illegal advertisements that offered NSW residents inducements to participate in gambling or to open a betting account. For many years, Norfolk Island was a leading licensing jurisdiction for online gambling in Australia. On and from 1 July 2016, Norfolk Island lost its right to self-govern and became, in effect, a regional council of New South Wales. As a result of both this process and an independent report into the performance of the NIGA commissioned by the federal government in February 2016, the NIGA was dissolved on 31 March 2017. All licences granted by NIGA expired on that date. This has caused many pre-existing Norfolk Island licensees to re-licence in the Northern Territory, where most Australian online gambling operations are now domiciled. In October 2016, 18 Crown Resorts employees were arrested in China. The Crown Resorts employees, who have been detained in Shanghai, are expected to face court this year in relation to as yet undisclosed ‘gambling crimes’ that appear to be associated with the promotion of gambling activities and recruitment of Chinese nationals to gamble in Crown’s Australia-based casinos. These developments have signalled an increased focus on the activities of Australian casinos in sourcing VIP customers from overseas (particularly in China). In February 2017, CrownBet and ClubsNSW (a wagering operator that is 62 per cent owned by Crown Resorts) announced that it had entered into a 10-year, A$300 million deal that will allow CrownBet customers to bet on a specially designed app and withdraw cash from terminals in ClubsNSW venues. Tabcorp, which holds the exclusive licence to offer betting services from retail venues in NSW, has announced that it has entered into a similar arrangement with the Australian Hotels Association. Over the past year, the Australian market has seen an increased interest in daily fantasy sports products. At this stage, these products have been incorporated into the existing legislative framework for sports bookmaking. However, should interest in these products continue to grow, existing legislation may be amended to specifically deal with this new form of gaming. Consistent with the growing international interest in virtual gambling models, the Australian market has also seen growing interest in e-sports betting and betting on the outcome of lotteries. 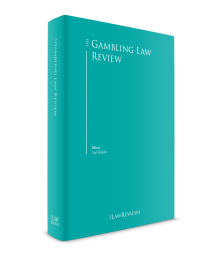 The proposed changes to the existing federal legislation that regulates the provision of gambling services to Australian residents have been discussed throughout this chapter. However, owing to the developing public interest in the industry, it is possible that further debate will give rise to additional changes to the measures proposed by the IGA Amendment Bill. For example, in January 2017, Senator Pauline Hanson of One Nation introduced an amendment to the Bill, which proposed to ban betting on the outcome of lotteries. This amendment was not passed. We expect that further amendments to the IGA Amendment Bill will be proposed before it is passed by both Houses of Parliament. The federal government has also announced that a National Consumer Protection Framework will be implemented to introduce consistent harm minimisation measures across all Australian jurisdictions. It is expected that this framework will come into effect later in the year. At the time of writing, a consultation paper has been released to obtain feedback in relation to the framework. In October 2016, Tabcorp announced that it had made a takeover offer for all of the issued shares in Tatts. Authorisation of this merger has been sought by Tabcorp from the Australian Competition Tribunal. At the time of writing, the Tribunal has not made a determination. The determination, once made, will alter materially Australia’s wagering and lotteries sector. 1 Jamie Nettleton is a partner, and Nicola Austin, Mia Corbett and Shanna Protic Dib are solicitors, at Addisons Lawyers. 3 At the time of writing, a merger proposal has been made by Tabcorp to acquire Tatts. This is being considered by the Australian Competition Tribunal (see Section VIII.ii, infra). 4 There is also specific state and territory legislation regulating interactive gambling, for example, Chapter 7 of the Gambling Regulation Act 2003 (Vic). 5 Generally, these agreements are entered into by wagering operators with the leading sporting bodies on a national basis. 6 It is proposed that this will be reduced to 25 per cent for businesses whose annual turnover is less than A$50 million by 2026–27. 7 Australian Competition and Consumer Commission (ACCC) v. Hillside (Australia New Media) Pty Ltd t/as Bet365  FCA 1007.